Since World War II, the US has never run such high fiscal deficits in times of full employment as it will now. With the tax cuts pushed through by the Republican Congress and signed into law by Trump in December, and to a lesser extent the budget passed in March, it is expected that the US will soon be running a fiscal deficit of over $1.0 trillion a year, exceeding 5% of GDP. This is unprecedented. We now have good estimates of how high the deficits will grow under current policy and in a scenario which assumes (optimistically) that the economy will remain at full employment, with no downturn. The Congressional Budget Office (CBO) published on April 9 its regular report on “The Budget and Economic Outlook”, this year covering fiscal years 2018 to 2028. In this report to Congress and to the public, the CBO assesses the implications of federal budget and tax policy, as set out under current law. The report normally comes out in January or February of each year but was delayed this year in order to reflect the tax bill approved in December and also the FY18 budget, which was only approved in March (even though the fiscal year began last October). The forecast is that the deficits will now balloon. This should not be a surprise given the magnitude of the tax cuts pushed through Congress in December and then signed into law by Trump, but recall that the Republicans pushing through the tax bill asserted deficits would not increase as a result. The budget approved in March also provides for significant increases in legislated spending – especially for the military but also for certain domestic programs. But as will be discussed below, government spending (other than on interest) over the next decade is in fact now forecast by the CBO to be less than what it had forecast last June. The CBO assessment is the first set of official estimates of what the overall impact will be. And they are big. 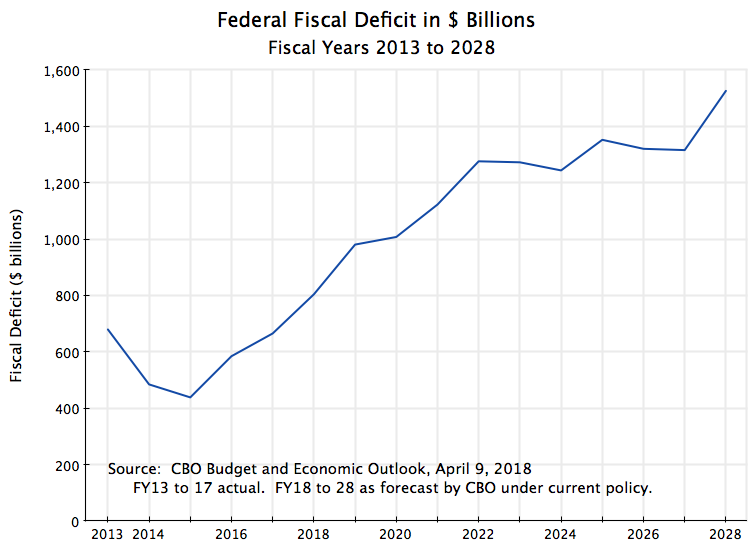 The CBO forecasts that even though the economy is now at full employment (and assumed to remain there for the purposes of the scenario used), deficits are forecast to grow to just short of $1 trillion in FY2019, and then continue to increase, reaching over $1.5 trillion by FY2028. In dollar terms, it has never been that high – not even in 2009 at the worst point in the recession following the 2008 collapse of the economy. That is terrible fiscal policy. While high fiscal deficits are to be expected during times of high unemployment (as tax revenues are down, while government spending is the only stabilizing element for the economy when both households and corporations are cutting back on spending due to the downturn), standard policy would be to limit deficits in times of full employment in order to bring down the public debt to GDP ratio. But with the tax cuts and spending plans this is not going to happen under Trump, even should the economy remain at full employment. And it will be far worse when the economy once again dips into a recession, as always happens eventually. This blog post will first discuss the numbers in the new CBO forecasts, then the policy one should follow over the course of the business cycle in order to keep the public debt to GDP under control, and finally will look at the historical relationship between unemployment and the fiscal deficit, and how the choices made on the deficit by Trump and the Republican-controlled Congress are unprecedented and far from the historical norms. The forecasts made by the CBO of the fiscal accounts that would follow under current policies are always eagerly awaited by those concerned with what Congress is doing. Ten-year budget forecasts are provided by the CBO at least annually, and typically twice or even three times a year, depending on the decisions being made by Congress. The CBO itself is non-partisan, with a large professional staff and a director who is appointed to a four-year term (with no limits on its renewal) by the then leaders in Congress. The current director, Keith Hall, took over on April 1, 2015, when both the House and the Senate were under Republican control. He replaced Doug Elmensdorf, who was widely respected as both capable and impartial, but who had come to the end of a term. Many advocated that he be reappointed, but Elmensdorf had first taken the position when Democrats controlled the House and the Senate. Hall is a Republican, having served in senior positions in the George W. Bush administration, and there was concern that his appointment signaled an intent to politicize the position. But as much as his party background, a key consideration appeared to have been Hall’s support for the view that tax cuts would, through their impact on incentives, lead to more rapid growth, with that more rapid growth then generating more tax revenue which would partially or even fully offset the losses from the lower tax rates. I do not agree. An earlier post on this blog discussed that that argument is incomplete, and does not take into account that there are income as well as substitution effects (as well as much more), which limit or offset what the impact might be from substitution effects alone. 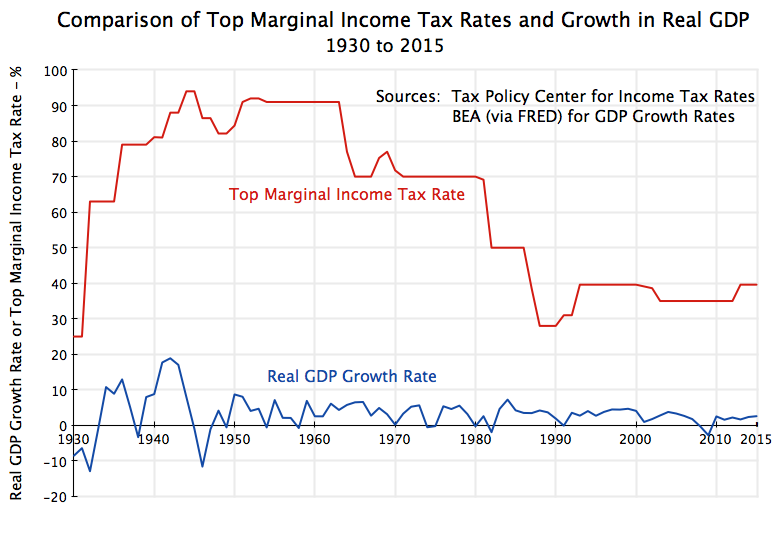 And another post on this blog looked at the historical experience after the Reagan and Bush tax cuts, in comparison to the experience after the (more modest) increases in tax rates on higher income groups under Clinton and Obama. It found no evidence in support of the argument that growth will be faster after tax cuts than when taxes are raised. What the data suggest, rather, is that there was little to no impact on growth in one direction or the other. Where there was a clear impact, however, was on the fiscal deficits, which rose with the tax cuts and fell with the tax increases. Given Hall’s views on taxes, it was thus of interest to see whether the CBO would now forecast that an acceleration in GDP growth would follow from the new tax cuts sufficient to offset the lower tax revenues following from the lower tax rates. The answer is no. While the CBO did forecast that GDP would be modestly higher as a result of the tax cuts (peaking at 1.0% higher than would otherwise be the case in 2022 before then diminishing over time, and keep in mind that these are for the forecast levels of GDP, not of its growth), this modestly higher GDP would not suffice to offset the lower tax revenues following from the lower tax rates. Taking account of all the legislative changes in tax law since its prior forecasts issued in June 2017, the CBO estimated that fiscal revenues collected over the ten years FY2018 to FY2027 would fall by $1.7 trillion from what it would have been under previous law. However, after taking into account its forecast of the resulting macroeconomic effects (as well as certain technical changes it made in its forecasts), the net impact would be a $1.0 trillion loss in revenues. This is almost exactly the same loss as had been estimated by the staff of the Joint Committee on Taxation for the December tax bill, which also factored in an estimate of a (modest) impact on growth from the lower tax rates. Fiscal spending projections were also provided, and the CBO estimated that legislative changes alone (since its previous estimates in June 2017) would raise spending (excluding interest) by $450 billion over the ten year period. However, after taking into account certain macro feedbacks as well as technical changes in the forecasts, the CBO is now forecasting government spending will in fact be $100 billion less over the ten years than it had forecast last June. The higher deficits over those earlier forecast are not coming from higher spending but rather totally from the tax cuts. Finally, the higher deficits will have to be funded by higher government borrowing, and this will lead to higher interest costs. Interest costs will also be higher as the expansionary fiscal policy at a time when the economy is already at full employment will lead to higher interest rates, and those higher interest rates will apply to the entire public debt, not just to the increment in debt resulting from the higher deficits. The CBO forecasts that higher interest costs will add $650 billion to the deficits over the ten years. The total effect of all this will thus be to increase the fiscal deficit by $1.6 trillion over the ten years, over what it would otherwise have been. The resulting annual fiscal deficits, in billions of dollars, would be as shown in the chart at top of this post. Under the assumed scenario that the economy will remain at full employment over the entire period, the fiscal deficit will still rise to reach almost $1 trillion in FY19, and then to over $1.5 trillion in FY28. Such deficits are unprecedented for when the economy is at full employment. The CBO is forecasting that fiscal deficits will rise to a range of 4 1/2 to 5 1/2% of GDP from FY2019 onwards. Again, this is unprecedented for the US economy in times of full employment. As noted above, fiscal policy has an important role to play during economic downturns to stabilize conditions and to launch a recovery. When something causes an economic downturn (such as the decision during the Bush II administration not to regulate banks properly in the lead up to the 2008 collapse, believing “the markets” would do this best), both households and corporations will reduce their spending. With unemployment increasing and wages often falling even for those fortunate enough to remain employed, as well as with the heightened general concerns on the economy, households will cut back on their spending. Similarly, corporations will seek to conserve cash in the downturns, and will cut back on their spending both for the inputs they would use for current production (they cannot sell all of their product anyway) and for capital investments (their production facilities are not being fully used, so why add to capacity). Only government can sustain the economy in such times, stopping the downward spiral through its spending. Fiscal stimulus is needed, and the Obama stimulus program passed early in his first year succeeded in pulling the economy out of the freefall it was in at the time of his inauguration. GDP fell at an astounding 8.2% annual rate in the fourth quarter of 2008 and was still crashing in early 2009 as Obama was being sworn in. It then stabilized in the second quarter of 2009 and started to rise in the third quarter. The stimulus program, as well as aggressive action by the Federal Reserve, accounts for this turnaround. But fiscal deficits will be high during such economic downturns. While any stimulus programs will add to this, most of the increase in the deficits in such periods occur automatically, primarily due to lower tax revenues in the downturn. 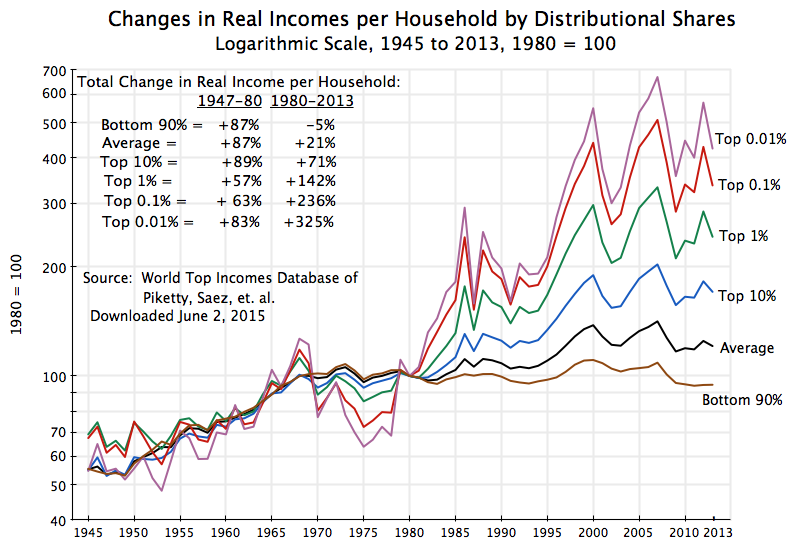 Incomes and employment are lower, so taxes due will be lower. There is also, but to a much smaller extent, some automatic increase in government spending during the downturns, as funds are paid out in unemployment insurance or for food stamps for the increased number of the poor. The deficits will then add to the public debt, and the public debt to GDP ratio will rise sharply (exacerbated in the short run by the lower GDP as well). One confusion, sometimes seen in news reports, should be clarified. While fiscal deficits will be high in a downturn, for the reasons noted above, and any stimulus program will add further to those deficits, one should not equate the size of the fiscal deficit with the size of the stimulus. They are two different things. For example, normally the greatest stimulus, for any dollar of expenditures, will come from employing directly blue-collar workers in some government funded program (such as to build or maintain roads and other such infrastructure). A tax cut focused on the poor and middle classes, who will spend any extra dollar they receive, will also normally lead to significant stimulus (although probably less than via directly employing a worker). But a tax cut focused on the rich will provide only limited stimulus as any extra dollar they receive will mostly simply be saved (or used to pay down debt, which is economically the same thing). The rich are not constrained in how much they can spend on consumption by their income, as their income is high enough to allow them to consume as much as they wish. Each of these three examples will add equally to the fiscal deficit, whether the dollar is used to employ workers directly, to provide a tax cut to the poor and middle classes, or to provide a tax cut to the rich. But the degree of stimulus per dollar added to the deficit can be dramatically different. One cannot equate the size of the deficit to the amount of stimulus. Deficits are thus to be expected, and indeed warranted, in a downturn. But while the resulting increase in public debt is to be expected in such conditions, there must also come a time for the fiscal deficits to be reduced to a level where at least the debt to GDP ratio, if not the absolute level of the debt itself, will be reduced. Debt cannot be allowed to grow without limit. And the time to do this is when the economy is at full employment. It was thus the height of fiscal malpractice for the tax bills and budget passed by Congress and signed into law by Trump not to provide for this, but rather for the precise opposite. The CBO estimates show that deficits will rise rather than fall, even under a scenario where the economy is assumed to remain at full employment. It should also be noted that the deficit need not be reduced all the way to zero for the debt to GDP ratio to fall. With a growing GDP and other factors (interest rates, the rate of inflation, and the debt to GDP ratio) similar to what they are now, a good rule of thumb is that the public debt to GDP ratio will fall as long as the fiscal deficit is around 3% of GDP or less. But the budget and tax bills of Trump and the Congress will instead lead to deficits of around 5% of GDP. Hence the debt to GDP ratio will rise. [Technical note for those interested: The arithmetic of the relationship between the fiscal deficit and the debt to GDP ratio is simple. A reasonable forecast, given stated Fed targets, is for an interest rate on long-term public debt of 4% and an inflation rate of 2%. This implies a real interest rate of 2%. With real GDP also assumed to grow in the CBO forecast at 2% a year (from 2017 to 2028), the public debt to GDP ratio will be constant if what is called the “primary balance” is zero (as the numerator, public debt, will then grow at the same rate as the denominator, GDP, each at either 2% a year in real terms or 4% a year in nominal terms) . The primary balance is the fiscal deficit excluding what is paid in interest on the debt. The public debt to GDP ratio, as of the end of FY17, was 76.5%. With a nominal interest rate of 4%, this would lead to interest payments on the debt of 3% of GDP. A primary balance of zero would then imply an overall fiscal deficit of 3% of GDP. Hence a fiscal deficit of 3% or less, with the public debt to GDP ratio roughly where it is now, will lead to a steady debt to GDP ratio. Federal government debt rose to over 100% of GDP during World War II. The war spending was necessary. But it did not then doom the US to perpetual economic stagnation or worse. Rather, fiscal deficits were kept modest, the economy grew well, and over the next several decades the debt to GDP ratio fell. Fiscal balances were mostly but modestly in deficit (and occasionally in surplus) through the 1950s, 60s, and 70s. The 3% fiscal deficit rule of thumb worked well, and one can see that as long as the fiscal deficit remained below 3% of GDP, the public debt to GDP ratio fell, to a low of 23% of GDP in FY1974. It then stabilized at around this level for a few years, but reversed and started heading in FY1982 after Reagan took office. And it kept going up even after the economy had recovered from the 1982 recession and the country was back to full employment, as deficits remained high following the Reagan tax cuts. The new Clinton budgets, along with the tax increase passed in 1993, then stabilized the accounts, and the economy grew strongly. The public debt to GDP ratio, which had close to doubled under Reagan and Bush I (from 25% of GDP to 48%), was reduced to 31% of GDP by the year Clinton left office. But it then started to rise again following the tax cuts of Bush II (plus with the first of the two recessions under Bush II). And it exploded in 2008/2009, at the end of Bush II and the start of Obama, as the economy plunged into the worst economic downturn since the Great Depression. The debt to GDP ratio did stabilize, however, in the second Obama term, and actually fell slightly in FY2015 (when the deficit was 2.4% of GDP). But with the deficits now forecast to rise to the vicinity of 5% of GDP (and to this level even with the assumption that there will not be an economic downturn at some point), the public debt to GDP ratio will soon be approaching 100% of GDP. This does not have to happen. As noted above, one need not bring the fiscal deficits all the way down to zero. A fiscal deficit kept at around 3% of GDP would suffice to stabilize the public debt to GDP ratio, while something less than 3% would bring it down. What stands out in these forecasts is how much the deficits anticipated now differ from the historical norms. The CBO report has data on the deficits going back to FY1968 (fifty years), and these can be used to examine the relationship with unemployment. As discussed above, one should expect higher deficits during an economic downturn when unemployment is high. But these deficits then need to be balanced with lower deficits when unemployment is lower (and sufficiently low when the economy is at or near full employment that the public debt to GDP ratio will fall). An interesting finding is that the high deficits in the early Obama years are actually very close to what one would expect given the historical norm, given the unemployment rates Obama faced on taking office and in his first few years in office. That is, the Obama stimulus programs did not cause the fiscal deficits to grow beyond what would have been expected given what the US has had in the past. The deficits were high because unemployment was high following the 2008 collapse. At the other end of the line, one has the fiscal surpluses in the years FY1998 to 2000 at the end of the Clinton presidency. As noted above, the public debt to GDP ratio stabilized soon after Clinton took office (in part due to the tax increases passed in 1993), with the fiscal deficits reduced to less than 3% of GDP. Unemployment fell to below 5% by mid-1997 and to a low of 3.8% in mid-2000, as the economy grew well. By FY1998 the fiscal accounts were in surplus. And as seen in the scatter plot above, the relationship between unemployment and the fiscal balance was close in those years (FY1998 to 2000) to what one would expect given the historical norms for the US. But the tax cuts and budget passed by Congress and signed by Trump will now lead the fiscal accounts to a path far from the historical norms. 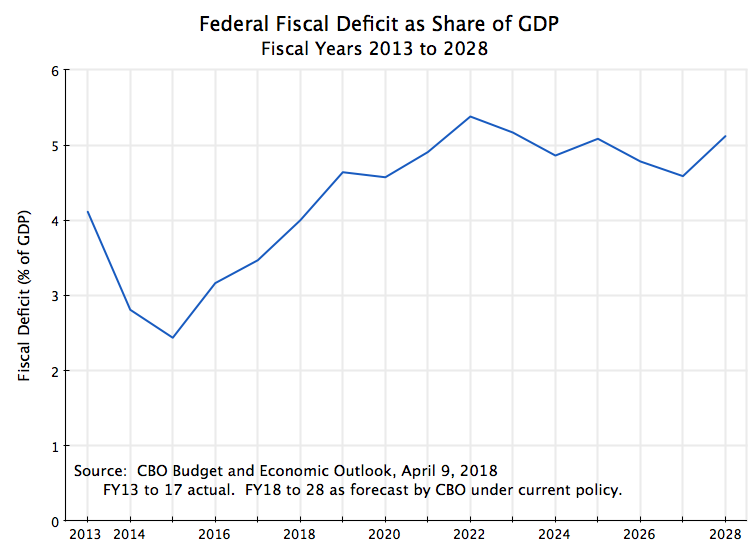 Instead of a budget surplus (as in the later Clinton years, when the unemployment rate was similar to what the CBO assumes will hold for its scenario), or even a deficit kept to 3% of GDP or less (which would suffice to stabilize the debt to GDP ratio), deficits of 4 1/2 to 5 1/2 % of GDP are foreseen. 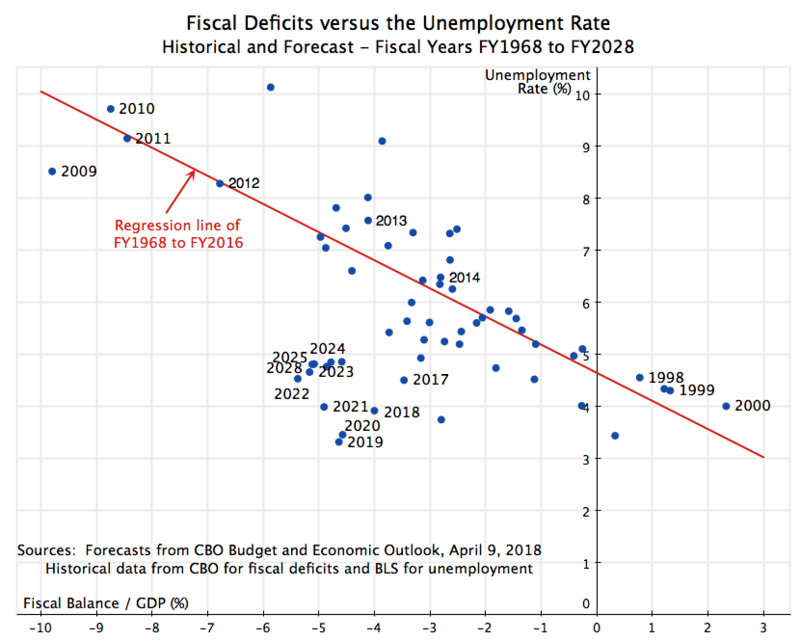 The scatter of points for the fiscal deficit vs. unemployment relationship for 2018 to 2028 is in a bunch by itself, down and well to the left of the regression line. One has not had such deficits in times of full employment since World War II. Fiscal policy is being mismanaged. The economy reached full employment by the end of the Obama administration, fiscal deficits had come down, and the public debt to GDP ratio had stabilized. There was certainly more to be done to bring down the deficit further, and with the aging of the population (retiring baby boomers), government expenditures (for Social Security and especially for Medicare and other health programs) will need to increase in the coming years. Tax revenues to meet such needs will need to rise. But the Republican-controlled Congress and Trump pushed through measures that will do the opposite. Taxes have been cut dramatically (especially for corporations and rich households), while the budget passed in March will raise government spending (especially for the military). 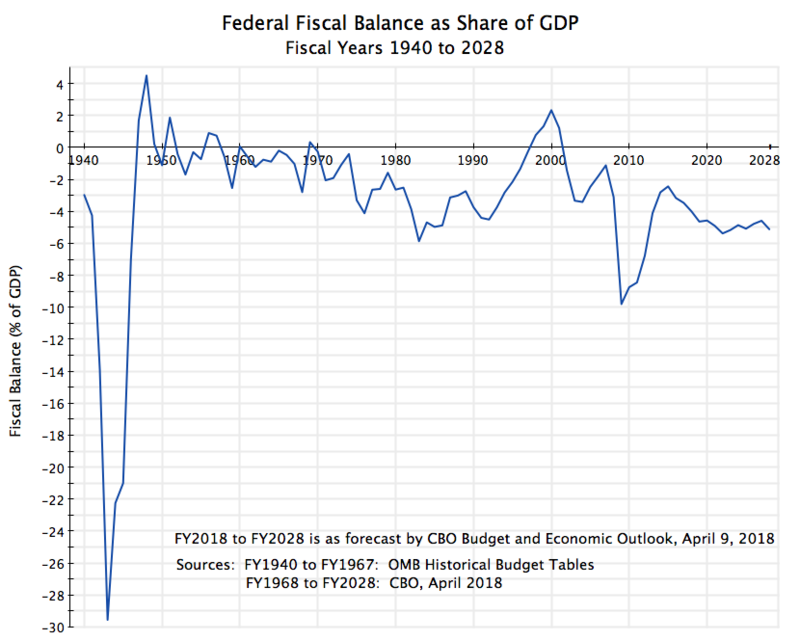 Even assuming the economy will remain at full employment with no downturn over the next decade (which would be unprecedented), fiscal deficits will rise to around 5% of GDP. As a consequence, the public debt to GDP ratio will rise steadily. This is unprecedented. With the economy at full employment, deficits should be reduced, not increased. They need not go all the way to zero, even though Clinton was able to achieve that. A fiscal deficit of 3% of GDP (where it was in the latter years of the Obama administration) would stabilize the debt to GDP ratio. But Congress and Trump pushed through measures to raise the deficit rather than reduce it. This leaves the economy vulnerable. There will eventually be another economic downturn. There always is one, eventually. The deficit will then soar, as it did in 2008/2009, and remain high until the economy fully recovers. But there will then be pressure not to allow the debt to rise even further. This is what happened following the 2010 elections, when the Republicans gained control of the House. With control over the budget, they were able to cut government spending even though unemployment was still high. Because of this, the pace of the recovery was slower than it need have been. While the economy did eventually return to full employment by the end of Obama’s second term, unemployment remained higher than should have been the case for several years as a consequence of the cuts. At the next downturn, the fiscal accounts will be in a poor position to respond as they need to in a crisis. 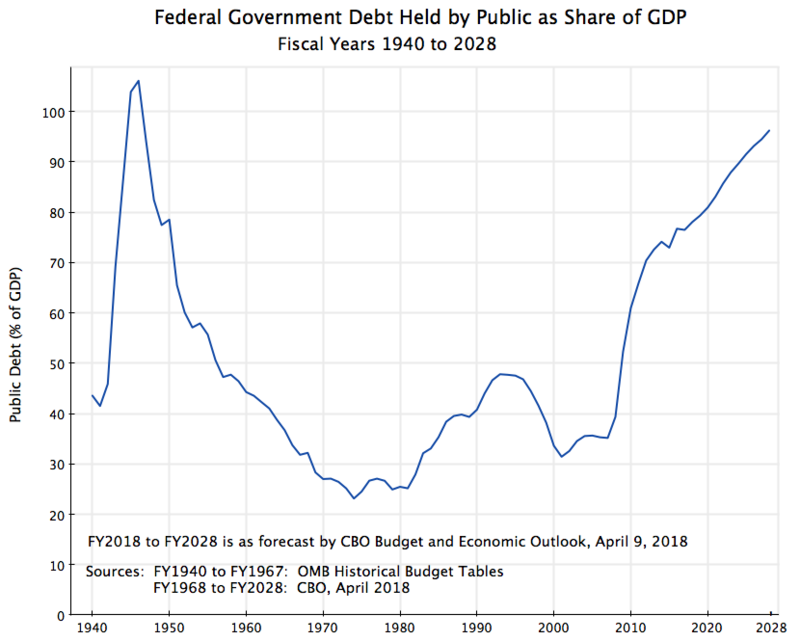 Public debt, already high, will soar to unprecedented levels, and there will be arguments from conservatives not to allow the debt to rise even further. Recovery will then be even more difficult, and many will suffer as a result. A recent post on this blog looked at the disappointing growth in the Eurozone since early 2011, when Europe shifted to austerity policies from its previous focus on recovery from the 2008 economic and financial collapse. There has indeed been no growth at all in the Eurozone in the three and a half years since that policy shift, with GDP at first falling by about 1 1/2% (leading to a double-dip recession) and then recovering by only that same amount thus far. The recovery has been exceedingly slow, and prospects remain poor. The consequences of the shift to austerity can be seen even more clearly in the unemployment figures. See the chart above (the data comes from Eurostat). Unemployment in Europe rose sharply starting in early 2008 and into early 2009. But it then started to level off in late 2009 and early 2010 following the stimulus programs and aggressive central bank programs launched in late 2008. Unemployment in the US followed a similar path during this period, and for similar reasons. But the paths then diverged. After peaking in early 2010 at about 10% and then starting to come down, the unemployment rate in the Eurozone switched directions and started to rise again in mid-2011. It reached 12.0% in early 2013 and has since come down slowly and only modestly to a still high 11.5% currently. In the US, in contrast, the unemployment rate reached a peak of 10.0% in October 2009, and has since fallen more or less steadily (with bumps along the way) to the current 5.8% (as of October 2014). It has been a slow recovery, but at least it has been a recovery. This divergence began in 2010, as Europe shifted from its previous expansionary stance to austerity. Influential Europeans, in particular German officials and Jean-Claude Trichet (then the head of the European Central Bank) argued that not only was austerity needed, but that austerity would be expansionary rather than contractionary. We now see that that was certainly not the case: GDP fell and unemployment rose. The most clear mark of that shift in policy can be found in the actions of the European Central Bank. ECB interest rates had been kept at a low 0.25% for its Deposit Facility rate (one of its main policy rates) for two years until April 2011. The ECB then raised the rate to 0.50% on April 13, and to 0.75% on July 13, 2011. But European growth was already faltering (for a variety of reasons), and it was soon recognized by most that the hike in ECB interest rates had been a major mistake. Trichet left office at the end on his term on November 1, replaced by Mario Draghi. On November 9 the ECB Board approved a reversal. The Deposit Facility rate was cut to 0.50% that day, to 0.25% a month later on December 11, and to 0.00% on July 11, 2012. Fiscal policy had also been modestly expansionary up to 2010, as monetary policy had been up to that point, but then went into reverse. Unfortunately, and unlike the quick recognition that raising central bank interest rates had been a mistake, fiscal expenditures have continued to be cut since mid-2010. Germany in particular called for cuts in fiscal spending for the members of the Eurozone, and forced through a significantly stricter set of rules for fiscal deficits and public debt to GDP ratios for Eurozone members. Discussions began in 2010, amendments to the existing “Stability and Growth Pact” were approved on March 11, 2011, and a formal new treaty among Eurozone members was signed on March 2, 2012. The new treaty (commonly referred to as the Fiscal Compact) mandated a balanced budget in structural terms (defined as not exceeding 0.5% of GDP when the economy was close to full employment, with a separate requirement of the deficit never exceeding 3% of GDP no matter how depressed the economy might be). Financial penalties would be imposed on countries not meeting the requirements. Government fiscal expenditures in the Eurozone had been growing in real terms in line with real GDP up to 2008, at around 2 to 3% a year. With the onset of the crisis, fiscal expenditures at first grew to counter the fall GDP. But instead of then allowing fiscal expenditures to continue to grow even at historical rates, much less the higher rates that would have been warranted to offset the fall in private demand during the crisis, fiscal expenditures peaked in mid-2010 and were then cut back. By 2014 they were on the order of 14 to 15% below where they would have been had they been allowed to keep to their historical path. This has suppressed demand and therefore output. The path of US real government expenditures is also shown on the graph. Note that government expenditures here include all levels of government (federal, state, and local), and include all government expenditures including transfers (such as for Social Security). 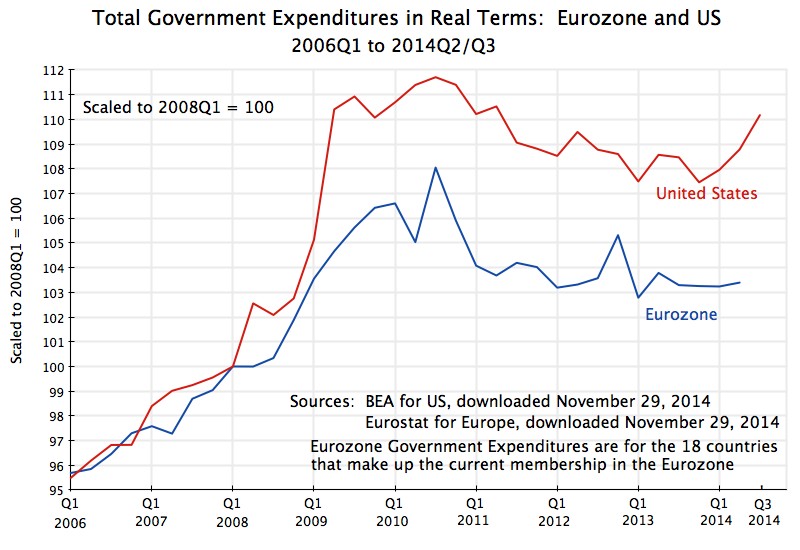 Government expenditures for the Eurozone are defined similarly. The US data comes from the BEA, while the Eurozone data comes from Eurostat. Government expenditures in the US also peaked in 2010, as they had in the Eurozone, and then fell. This has been discussed in previous posts on this blog. But while US government expenditures fell after 2010, they had grown by relatively more in the period leading up to 2010 than they had in the Eurozone, and then fell by relatively less. They have now in 2014 started to pick up, mostly as a consequence of the budget deal reached last year between Congress and President Obama. State and local government expenditures, which had been severely cut back before, have also now stabilized and started to grow as tax revenues have begun to recover from the downturn. And in part as a result, recent GDP growth in the US has been good, with real GDP growing by 4.6% in the second quarter of 2014 and by 3.9% in the third quarter. The fiscal path followed in the US could have been better. An earlier post on this blog calculated that GDP would have returned to its full employment level by 2013 if government spending had been allowed to grow merely at its historical rate. And the US could have returned to full employment by late 2011 or early 2012 if government spending had been allowed to grow at the more rapid rate that it had under Reagan. But with the fiscal cuts, unemployment has come down only slowly in the US. The recovery has been the slowest of any in the US for at least 40 years, and fiscal drag by itself can account for it. 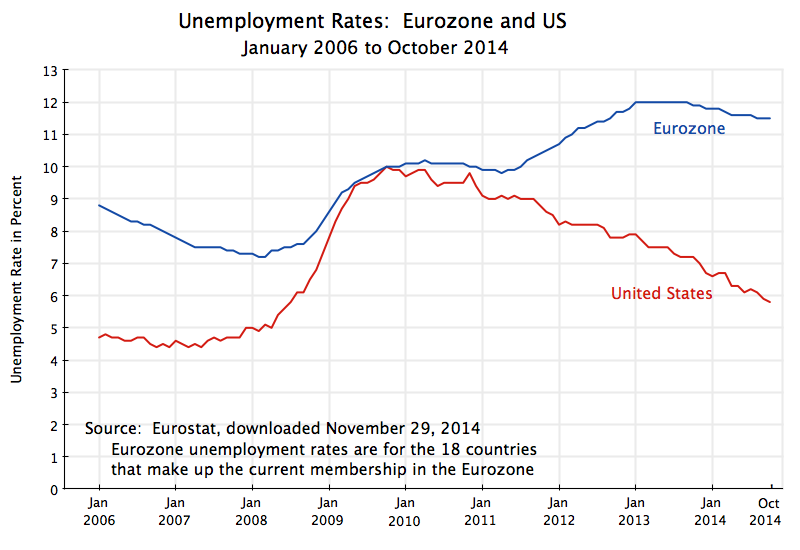 But at least unemployment has come down in the US, in contrast to the path seen in Europe. With the release last Friday by Eurostat of the initial GDP growth estimates for most of Europe for the third quarter of 2014, and the release on Monday of the initial estimate for Japan, it is a good time to provide an update on how successful austerity strategies have been. As was discussed in earlier posts in this blog on Europe (here and here), Europe moved from expansionary fiscal policies in its initial response to the 2008 downturn, to austerity programs with fiscal cutbacks starting in 2010/11. The initial expansionary policies did succeed in stopping the sharp downturn in output that followed the financial collapse of 2008/2009. European economies began to grow again in mid-2009, and by late 2010 had recovered approximately two-thirds of the output that had been lost in the downturn. So what has actually happened since the austerity programs were imposed in Europe? The chart at the top of this post shows the path of real GDP for the larger Eurozone economies as well as for the Eurozone as a whole, plus Japan and the US for comparison. The data for Europe (as well as the US) comes from Eurostat, with figures for 2014Q3 from the November 14 Eurostat press release, while the data for Japan came most conveniently from the OECD. Real GDP is shown relative to where it was in the first quarter of 2008, which was the peak for most of Europe before the 2008/09 collapse. In a word, the results in Europe have been terrible. Real GDP in the Eurozone as a whole is basically the same as (in fact slightly less than) what it was in early 2011, three and a half years ago. To be more precise, real GDP in the Eurozone fell by a bit more than 1% between early 2011 and early 2013, and since then rose by a bit over 1%, but it has basically been dead. There has been no growth in the three and a half years since austerity programs took over. And Eurozone output is still more than 2% below where it had been in early 2008, six and a half years ago. Since early 2011, in contrast, the US economy grew by 8.6% in real terms. Annualized, this comes to 2.4% a year. While not great (fiscal drag has been a problem in the US as well), and not sufficient for a recovery from a downturn, the US result was at least far better than the zero growth in the Eurozone. There was, not surprisingly, a good deal of variation across the European economies. 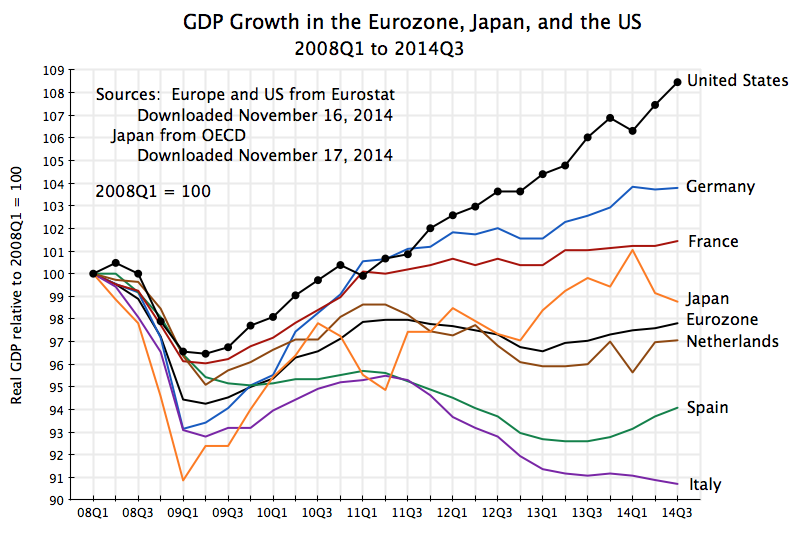 The chart shows the growth results for several of the larger economies in the Eurozone. Germany has done best, but its growth flattened out as well since early 2011. As was discussed in an earlier post, Germany (despite its rhetoric) in fact followed fairly expansionary fiscal policies in 2009, with further increases in 2010 and 2011 (when others, including the US, started to cut back). And as the chart above shows, the recovery in Germany was fairly solid in 2009 and 2010, with this continuing into 2011. But it then slowed. Growth since early 2011 has averaged only 0.9% a year. Other countries have done worse. There has been very little growth in France since early 2011, and declines in the Netherlands, Spain, and Italy. Spain was forced (as a condition of European aid) to implement a very tight austerity program following the collapse of its banking system in 2008/09 as a consequence of its own housing bubble, but has loosened this in the last year. Only in France is real GDP higher now than where it was in early 2008, and only by 1.4% total over those six and a half years. But France has also seen almost no growth (just 0.4% a year) since early 2011. The new figures for Japan were also bad, and many would say horrible. After falling at a 7.3% annualized rate in the second quarter of this year, real GDP is estimated to have fallen by a further 1.6% rate in the third quarter. The primary cause for these falls was the decision to go ahead with a planned increase in the consumption tax rate on April 1 (the start of the second quarter) from the previous 5% to a new 8% rate, an increase of 60%. The Japanese consumption tax is often referred to in the US as a sales tax, but it is actually more like a value added tax (such as is common in Europe). It is a tax on sales of goods and services to final consumers such as households, with offsets being provided for such taxes paid at earlier stages in production (which makes it more like a value-added tax). As a tax on consumption, it is the worst possible tax Japan could have chosen to increase at this time, when the economy remains weak. There is insufficient demand, and this is a straight tax on consumption demand. It is also regressive, as poor and middle class households will pay a higher share of their incomes on such a tax, than will a richer household. With its still weak economy, Japan should not now be increasing any such taxes, and increasing the tax on consumption is the worst one they could have chosen. With recessions conventionally defined as declines in real GDP in two consecutive quarters, Japan is now suffering its fourth recessionary contraction (a “quadruple-dip” recession) since 2008. This may be unprecedented. Japan’s output is still a bit better, relative to early 2008, than it is for the Eurozone as a whole, but it has been much more volatile. Prime Minister Shinzo Abe was elected in December 2012 and almost immediately announced a bold program to end deflation and get the economy growing again. It was quickly dubbed “Abenomics”, and was built on three pillars (or “arrows” as Abe described it). The first was a much more aggressive monetary policy by the Central Bank, with use of “quantitative easing” (such as the US had followed) where central bank funds are used to purchase long term bonds, and hence increase liquidity in the market. The second arrow was further short-term fiscal stimulus. And the third arrow was structural reforms. In practice, however, the impacts have been mixed. Expansionary monetary policy has been perhaps most seriously implemented, and it has succeeded in devaluing the exchange rate from what had been extremely appreciated levels. This helped exporters, and the stock market also boomed for a period. The Nikkei stock market average is now almost double where it was in early November 2012 (when it was already clear to most that Abe would win in a landslide, which he then did). But the impact of such monetary policy on output can only be limited when interest rates are already close to zero, as they have been in Japan for some time. The second “arrow” of fiscal stimulus centered on a package of measures announced and then approved by the Japanese Diet in January 2013. But when looked at more closely, it was more limited than the headline figures suggest. In gross terms, the headline expenditure figure amounted to a bit less than 2% of one year’s GDP, but the spending would be spread over more than one year. It also included expenditures which were already planned. It therefore needs to be looked at in the context of overall fiscal measures, including the then planned and ultimately implemented decision to raise the consumption tax rate on April 1, 2014. The IMF, in its October 2013 World Economic Outlook, estimated that the net impact of all the fiscal measures (including not only the announced stimulus programs, but also the tax hike and all other fiscal measures) would be a neutral fiscal stance in 2013 (neither tightening nor loosening) and a tightening in the fiscal stance of 2.5% of GDP in 2014. The fall in GDP this year should therefore not be a surprise. Finally, very little has been done on Abe’s third “arrow” of structural reforms. On balance, Abe’s program supported reasonably good growth of 2.4% for real GDP in 2013 (see the chart above). There was then a spike up in the first quarter of 2014. However, this was largely due to consumers pulling forward into the first quarter significant purchases (such as of cars) from the second quarter, due to the planned April 1 consumption tax hike. Some fall in the second quarter was then not seen as a surprise, but the fall turned out to be a good deal sharper than anticipated. And the further fall in the third quarter was a shock. As a result of these developments, Abe has announced that he will dissolve the Diet, hold new elections in mid-December with the aim of renewing his mandate (he is expected to win easily, due to disorder in the opposition), and will postpone the planned next increase in the consumption tax (from its current 8% to a 10% rate) from the scheduled October 2015 date to April 2017. Whether the economy will be strong enough to take this further increase in a tax on consumption by that date remains to be seen. The government has no announced plans to reverse the increase of 5% to 8% last April. Japan’s public debt is high, at 243% of GDP in gross terms as of the end of 2013. Net debt is a good deal lower at 134% (debt figures from IMF WEO, October 2014), but still high. The comparable net debt figure for the US was 80% at the end of 2013 (using the IMF definitions for comparability; note this covers all levels of government, not just federal). Japan will eventually need to raise taxes. But when it does, with an economy just then emerging from a recession due to inadequate demand, one should not raise a tax on consumption. A hike in income tax rates, particularly on those of higher income, would be far less of a drag on the economy.